Does your dream latte have miles of velvet microfoam swirled on top? The best way to serve light-as-air milk foam and hot milk for trendy speciality coffees is to keep the milk fresh at 39 °F prior to heating and frothing. Add cold milk and the Jura Cool Control Basic will bring the temperature down until it reaches 39 °F, it is then maintained constantly within that optimum range. This pre-set temperature guard prevents freezing and saves energy. The high-quality, 20 ounce stainless steel inner container is easy to remove and is dishwasher safe. The Jura Cool Control Basic is easy to open, fill with milk, and even store in the refrigerator as needed. 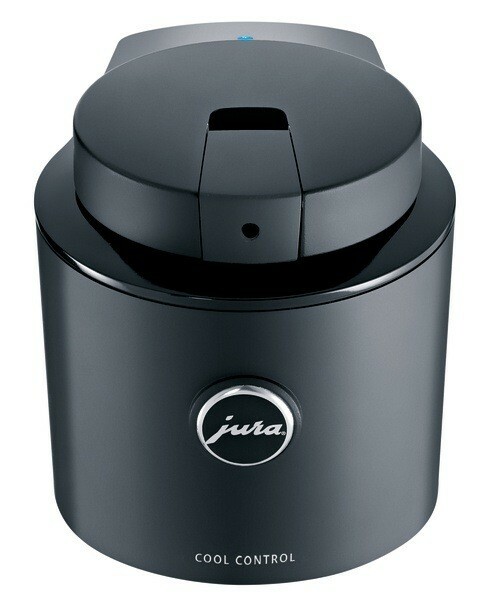 Also available in a larger 34 ounce capacity as the Jura Cool Control. Cools 20 Ounces of Milk - Jura's Cool Control Basic keeps the right amount of milk available at the perfect chilled temperature.